At the Races or Racing UK? Battle of the Satellite Channels – Who has your vote? ITV’S return to the televised racing fray has, it would be fair to say, injected a new sense of excitement and sense of occasion to the game. Ed Chamberlin and co went under the microscope at a soggy Cheltenham on New Year’s Day and will continue to face a stern examination from the racing public over the coming months. But perhaps more interesting is what effect their arrival on the scene has on our existing broadcasters and the offering they give to us on a daily basis. Both At The Races and Racing UK are staples in the homes of ardent racing fans up and down the land. But the satellite channels are just that – for the ardent punter. And as such, their brief is very different from that of the new gang at ITV. You’ll find no talk here of “a mare being a female horse” nor Matt Chapman having to explain that staking £4 at 9/4 will return you £13. Away from the mainstream arena, both ATR and RUK have been providing stellar coverage for punters and doing a damn good job of it. ATR were first on the scene back in 2000 and, being owned by Sky, have the advantage that their output is included with the Sky Sports package (more on that later). The station is a behemoth when it comes to international coverage with Irish racing particularly well served due to its partner racecourse agreements. But perhaps its biggest strength in this regard is the North American offering, when the channel is able to take centre stage at the likes of the Breeder’s Cup and truly play its hand as a niche broadcaster. Likewise, if Australian racing takes your fancy, the channel will serve up all manner of action from Down Under during the small hours and it’s this kind of syndication that wins a big thumbs up from punters who crave their racing 24/7. In front of the camera, ATR boasts a stellar line up of respected industry figures and its array of magazine shows make it hard to beat. The likes of The Sunday Forum and On The Line (the Monday phone-in which has helped project the aforementioned Chapman to prominence) are a huge plus point. 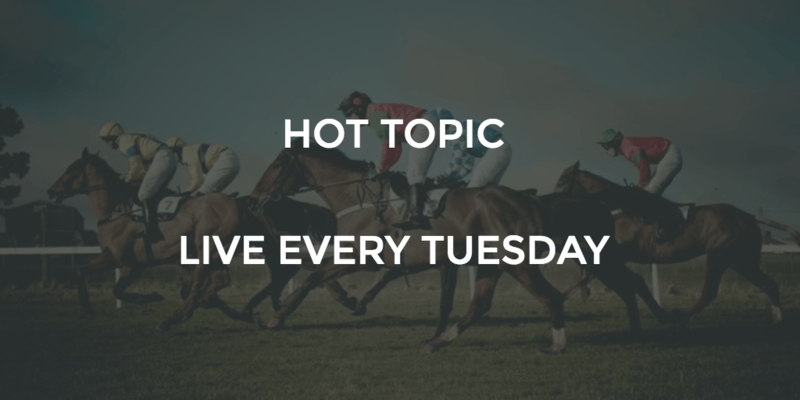 In contrast to RUK, which at times can produce something of a ‘loop’ feel when it comes to its output, ATR tends to be on its game in this regard with a daily Racing News bulletin and content that always feels up-to-the-minute. In recent years, the channel has perhaps become best known for the likes of Chapman and fresh broadcasting talent like Luke Harvey and Jason Weaver, but go back not that long and the likes of Derek Thompson and Robert Cooper (who still feature to this day) played anchor roles in the output. It is without doubt a balanced product which, although no frills, offers the punter everything from rock solid content to sharp inside angles. Its Irish coverage, in particular, is of the highest calibre in terms of content with the excellent Gary O’Brien worth his weight in gold. Racing UK was slightly later on to the scene in 2004 and offers a subscription service to fans with coverage from RMG’s 34 tracks around Britain. In terms of bang for buck, it can be argued whether or not the channel touches ATR in terms of output, but what it is doing is filling a vital void in the market. Last year, its migration to broadcasting in high definition saw the channel kick things up a notch in terms of the production values and this is an acute advantage it has over rivals ATR. To many, it may not matter, but to this viewer the ability to watch the equine action in glorious HD is certainly something that has taken RUK to another level. With content, RUK is definitely quality over quantity. While they may lack the strong feature work of a Channel 4 in their prime, the analysis pieces on their excellent Verdict shows are second to none. Fast rising broadcast stars like Oli Bell have shot to prominence on the channel and it was no surprise when he got the call to join the newly formed ITV team. The unsung hero in many ways, though, is Lydia Hislop, who has anchored the channel with great professionalism and rates by far and away their top on course presenter. Studio shows like The Betting Lab, featuring regular pundit Tony Calvin, also rate must-view material on a Friday night and help round off the channel’s offering. Gun to head, who gets the vote? Charging the guts of £25 per month to punters who are already shelling out for Sky means that Racing UK will always have to go the extra mile to land a blow. However, they do offer some tremendous incentives for members such as £300 worth of free raceday tickets and, from my own perspective, it’s a channel I could not do without. I hold their product in the highest of regard. Given the choice between the two, I simply love the production values and depth of analysis offered by RUK. However, ATR and the access it boasts to a far wider audience, means it will always just win the ‘value’ race by a nose. The one thing we can all be agreed on, though, is how great it is to have two fantastic broadcasters serving up our racing each and every day of the year. Long may it continue. We did a Twitter vote the other day and it’s fair to say views are so split – we’d love to hear your views. Comment below and join the debate, who do you prefer? Why? I actually have a question here regarding Racing UK. I recently moved into a new place and subscribed to BT TV with Broadband. They have the Racing UK channel on the TV Guide but when you go to watch it the channel says it’ isn’t available. Now I am a Racing UK member so I’d have assumed if I paid for it I could watch on TV? Weird why they would have it on the guide but, despite being a member, I cannot watch on TV. I even tried on the free to air day and nothing. ATR doesnt cost extra,covers overseas and Irish racing so its a no brainer. Add to that the entertainmen value of Matt Chapman and the hilarious Friday show Get in! Can’t justify the cost of Racing UK, especially when most of the big meetings are on terestrial tv. Very much enjoy At The Races coverage. I pay for RUK, but I probably get more rewards for watching ATR properly. Cooper/Harvey/Mapletoft/Chapman seem to instinctively find the right connections to talk to, and I have backed so many winners that I would never have found in the form book, due to their interviews. RUK is based purely on the subjective opinion of the team, and has none of this pre race interaction, and will always suffer as a result, when winner finding.